One of the new machines which we added to the center is a cryosauna which is still awaiting city approval. The cryosauna encourages anti-inflammatory and toxin –flushing response by safely exposing the body to temperatures as low as -256 degrees. Our newly expanded center will also be housing an infrared sauna. The infrared sauna will help with blood pressure reduction and skin rejuvenation by penetrating tissue with infrared light. We encourage athletes to walk-in, schedule an appointment or sign-up for one of our membership packages. In July we expanded our athletic center in Highland and added new machines. 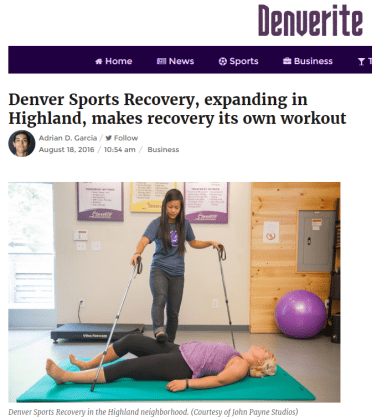 We are thankful to have received support from online publication Denverite who mentioned our newly expanded sports recovery center at 2242 W. 29th Ave. in Denver Colorado. We spent more than $150,000 to double the space of our facility to 3,600 square feet.After maxing out our old space and feeling like we were working on top of each other we knew it was time to expand. We are thankful to have grown to more than 200 members since opening in 2012. At Denver Sports Recovery we teach people about “active recovering”. Our sports recovery center works with athletes of all types on stretching and using the newest technology to help athletes recover. Memberships range in price from $89-$199. In addition to our expanded space and new machines our partner therapy businesses also moved in with us during the past year. NeuraPerformance which offers custom brain based programs for performance and brain health. Onus iV Hydration which offers all the benefits of an IV without having to go to a hospital. Visit Denverite to view the full article on our expansion. 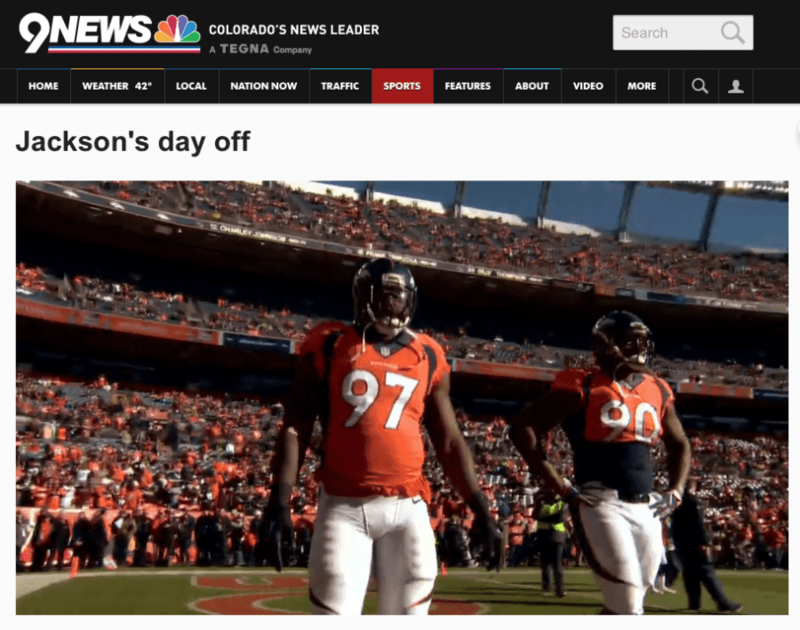 Click here to check out the recent Fitness Tips article by William Porter from the Denver Post. 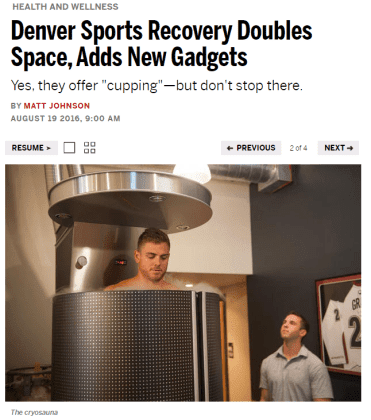 Perform, Recover, Rebuild at Denver Sports Recovery. Click here. Did all the summer bbqs and beers leave you feeling a little overweight, bloated, and unhealthy? Looking for a way to shed those extra pounds and clean out your system? Ready to take your health to the next level? Kick-start the Fall with Dr. Matt’s three-week detox program, starting September 21st, 2013! And as our end of summer/back-to-school gift to you… From now until September 17th, We are offering this program for the ridiculously low price of $200! “I would recommend this Detox plan to anyone who wants to change their current health condition. I feel really good. I have lost weight (12lbs in 21 DAYS) not by dieting, but simply by eating more often, and choosing good foods…I’m pleased with the results and have decided to do this 3 times a year.” – SBNow you might be thinking, “This sounds great, but I don’t have the time.” Let me tell you, this program has been specifically designed to save you time. You go to the grocery store at least once a week right? Well during the three weeks of the program you’ll never have to wonder what to buy or make. All your meals are planned for you and they taste great too! Now I’m not coming over to cook for you, but the recipes are easy to follow, don’t take long, and will actually provide you enough to eat for several meals. The process is simple and gentle. You might experience some mild symptoms if you’re a habitual consumer of coffee, alcohol, sugar, or processed foods but it likely won’t last long. Throughout the program, you’ll have support from me and from the entire group – other people who are going through the exact same experience as you are, and who can offer their words of encouragement. Or you could also be saying, “I would do it, but it’s too expensive.” Believe me, I can understand financial concerns, but this price is a great deal. I’ve offered this program before at almost four times this price, but I want to give you an “offer you can’t refuse”!! I won’t keep the price this low for long though. So what does this program include? “My co-workers and family members are impressed that I went through this program and I continue to practice good eating habits. I am proud that I did it for myself.” -CD, January 2011 detox participantI’ve been doing detox programs personally and with patients for the last 15 years. I’m continually amazed at the how they can transform health and vitality. Join us and see for yourself!“Working with Dr. Matt was a great experience. I learned a lot about what my body wants and needs and made some changes that work for me. The program impacted several different areas of my life, all in beneficial ways. Our meetings were always informative and fun. Dr. Matt allowed me to be focused and goal-oriented while giving me the space to be accepting and conscious about myself and my choices.” -IJImagine how it will feel to complete this program! What will you do with more energy throughout the day? Can you imagine knowing what foods make you feel fantastic and which ones do not? Won’t it be great to fit into those skinny jeans again?Sign up now to receive the amazing price of $200! NEW RECOVERY CENTER LOCATION OPENING SOON! We are excited for the upcoming opening of our new Recovery Center location. Check back for updates on the opening date. Until then, you can still make appointments.